As CPAP users we all know how beneficial our treatment is and how much better we feel after a good night’s sleep. The issue we face isn’t when we are home, but when we travel. Traveling with sleep apnea means dragging along your CPAP machine. If you’re like me you ask the question- do I pack my CPAP or not? To travel with a CPAP, we have to pull out the power cord that we have hidden behind the bed, find our CPAP travel bag, make sure that we pack every component we need (mask, tubing, filters). Even worse when we fly we must make sure to list the medical device as an extra carry on. Then sleep without our CPAP (keeping everyone awake with our snoring) while on the plane. Even thought I know better I tend to say “what a hassle, I will be fine without my machine for a few days” and leave it at home. Only to find that while I am on my trip, my daytime sleepiness and other sleep apnea symptoms start to show themselves. So why isn’t there a better solution? Well there is! The new mini travel CPAP’s offer the same great therapy in a much smaller size. They even offer some great added benefits. Like USB charging ports, overnight battery options, FAA compliance for in-flight use, waterless humidification and continued insurance compliance with your CPAP machine. Comprehensive Sleep Care Center is now offering the opportunity for our patients to call in and schedule a free consultation to learn about our mini travel CPAP’s. We have two new models available from the best CPAP manufactures in the world. 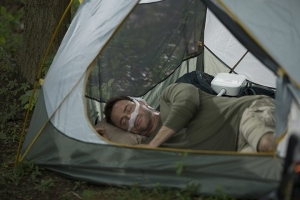 Come check out the small, lightweight, and inconspicuous device that allows patients to get the CPAP therapy they need while making traveling with sleep apnea easier. The side effects of sleep apnea—fatigue, high blood pressure, risk of heart disease and stroke—are well-known. But one issue that is not as widely talked about is sleep apnea and ED. Continued research finds that having sleep apnea can be a drag on your love life, causing erectile dysfunction in men as well as a loss of libido in women. Past studies in men have shown a spike in erectile dysfunction (ED) among men who suffer from the obstructive sleep disorder (OSA). A study done in Germany reported that 70 percent of men seeking sleep apnea treatment also suffered from ED. In another study, Doctors assessed patients with ED for evidence of sleep disordered breathing. They found that a whopping 91.3% of men with ED also had OSA. The researchers have stopped short of recommending ED drugs for men with sleep apnea, but they note that using a continuous positive airway pressure (CPAP) machine to treat sleep apnea can help with erectile dysfunction. Making the decision to consult a physician is the first important step, one that unfortunately can still be a difficult one for some men. Men who are struggling with issues related to sexual function should have a sleep study evaluation. 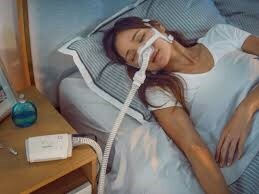 The good news is that treatments for obstructive sleep apnea such as CPAP therapy, oral appliance therapy, weight loss etc. — are safe and effective and can usually get you back in the game. If you are struggling with any of the issues discussed in this article, contact Comprehensive Sleep Care Center for a consultation and say hello to sleep again. CSCC looks forward to hearing from you! Leave us a message and a representative will contact you within 24 business hours. For immediate assistance during normal business hours, please call us at 703.729.3420. We offer quality sleep diagnostics and affordable pricing for people like you. Contact us today to say hello to sleep again.